Jerry Cleaver is the creator of Chicago's most successful writers' workshop, the Writers' Loft, and has been teaching writing for many years. 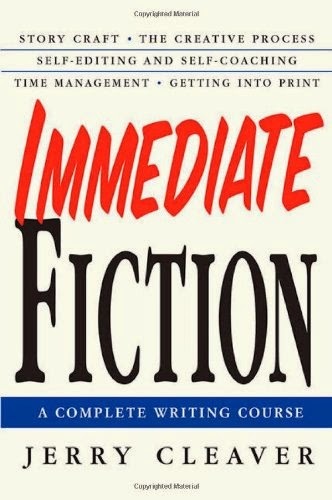 His Immediate Fiction: A Complete Writing Course is an inexpensive, portable version of what he teaches on his Immediate Fiction web site. In fact, this book is part of what that $2,000+ course gives you. Cleaver explains that the need to hear and share stories is one of the deepest human social needs. We'll even tell stories that put our safety and freedom at risk (such as when bank robbers can't resist sharing tales of their exploits which eventually get them arrested). A "story" in this sense is defined as a narrative that contains conflict, action, and resolution. Conflict occurs when a character or characters in a story want something, but there is an obstacle in their way. To get what they want, characters must take action. The action they take reveals something about them. In the end, they'll get what they're after or fail (which is "resolution"). In fact, Cleaver says that "if the characters are having a good time, the reader is not. If it's going well, it's going nowhere." What's the character doing to overcome the obstacle? How does that turn out? It's not necessarily one character in a scene who wants something. If characters have opposing "wants", it can lead to a more interesting story. For example, a detective in a mystery may want clues from a witness that would help unravel the case. The witness may want to tell the detective what he saw, but fears doing so because it would expose an affair he was having. While these two characters are verbally "battling" in the story, the reader learns more about both of them. Revealing character, according to Cleaver, is the writer's primary purpose at all times. Cleaver encourages writers to think about emotion as they write. Writers are encouraged to "look for all the emotions that the character could possibly be feeling at one time. If he could be feeling it, he should be feeling it." Remember that no matter how strangely a character or person is behaving, what they're doing makes perfect sense to them and would make sense to you if you understood how they see the world. The key is to understand what would make you act that way and reflect that in the character. Readers experience a story through the characters, and share the experience the character is having. If you have exposition to share with the reader, spread it out across the scene rather than doing a "dreaded info dump". When you're trying to decide what a character will do in a situation, ask yourself what is more dramatic and what will reveal more character, and do that. Pretty much every writer's first draft of a novel is bad. The successful novelist is the one who sticks with that bad novel and keeps polishing it until it's good. Cleaver's description of the writer's subconscious is excellent: "It's like having a trusted friend who helps you with everything, whom you must depend on to get anything done, but who every so often without warning and for no reason decides to clobber you." When you're on a roll, the subconscious is helping you keep in the flow. But sometimes it pops up and tells you that your writing is awful, that you should quit, etc. In addition to advice on writing fiction, Cleaver also covers overcoming writer's block, the difference between scriptwriting and fiction writing, and marketing your work. As you read through the book, the constant reminders to refer back to want, action, obstacle, resolution, and emotion feel incredibly redundant. But these are important concepts Cleaver is trying to pound into the reader's brain. It's written in a very conversational style, and manages to be both informative and fun to read. In my opinion, this book should be on every fiction writer's bookshelf. It's one I refer to again and again.